It’s time to start thinking about camping! As avid campers with a travel trailer we often start to plan and schedule our camping before the snow ever melts. The spring camping season usually starts in March for us with a trip during spring break. One of the reasons we are able to camp so frequently is because of the epic meal planning that I do every year. Having meals planned out and prepared in advance makes our outdoor adventures much more enjoyable. So stay tuned because I have some great recipes lined up to share with you! 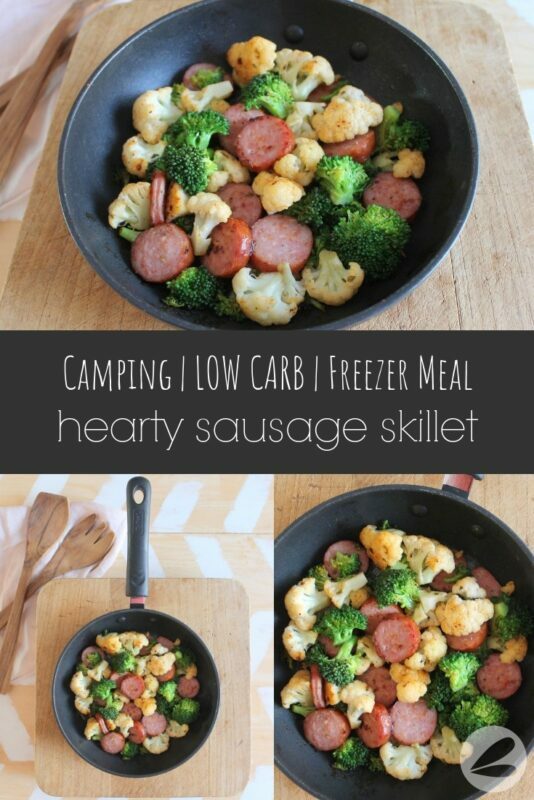 We’re starting off with this super easy Hearty Sausage Skillet camping meal. 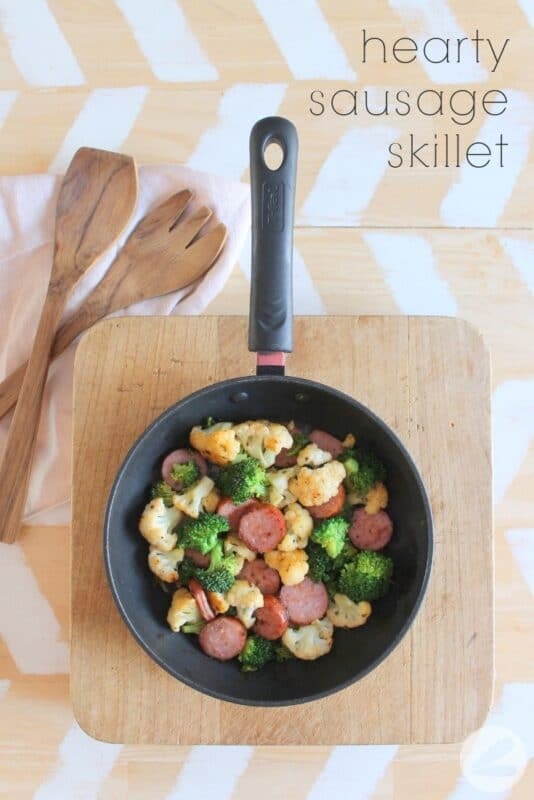 I absolutely love this Hearty Sausage Skillet recipe! You guys, its so easy AND delicious. It’s a meal that the whole family will love. 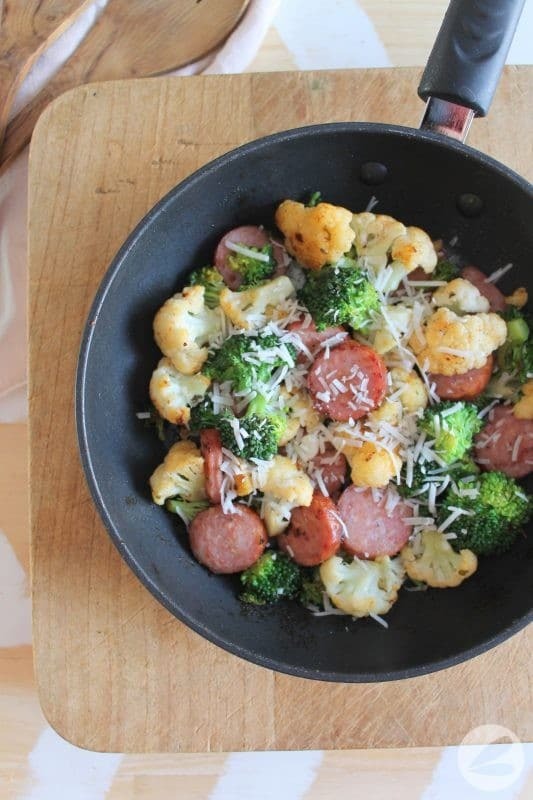 This recipe can very easily be made ahead of time and stored in the freezer until ready to pack and use for camping. 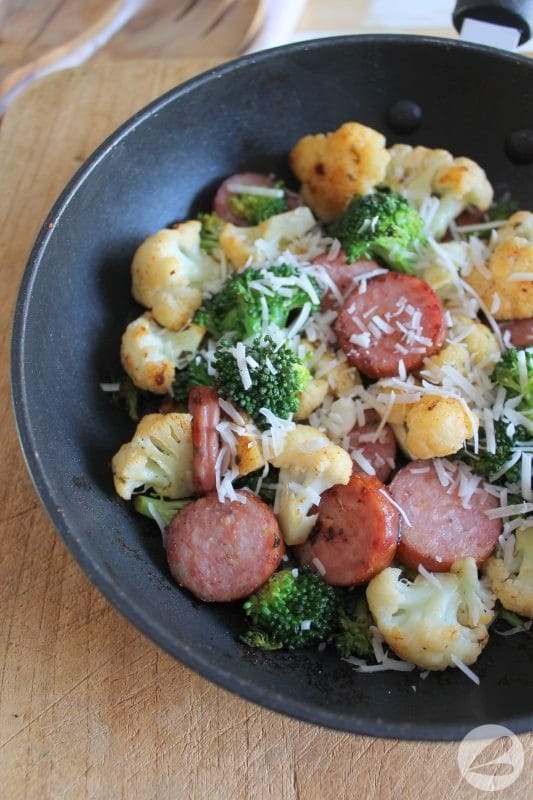 Simply purchase broccoli, cauliflower and sausage. Cut into bite sized pieces. I like the Harvest Farmers Sausage from Costco but you could go with your favorite pre-cooked sausage. We love local mennonite sausage too. Combine the ingredients into a large freezer safe plastic for storage and freeze for up to three months. Be sure to label the bag with your recipe and the date! Defrost and cook in a skillet over medium heat for about 10 minutes. You could also create a tinfoil packet and put this meal directly on the campfire. Cooking time will depend on how close the packet is to the coals and flames. 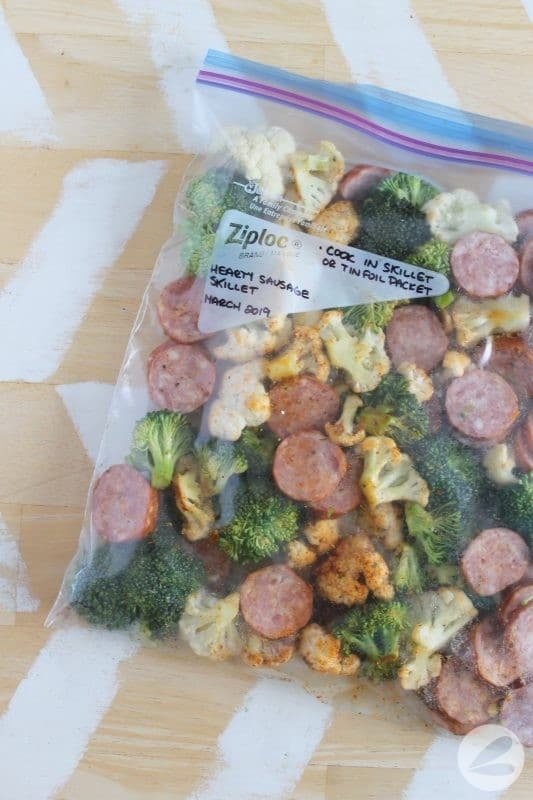 Defrost meals in the refrigerator and place into tinfoil packet for cooking or dump onto a skillet. 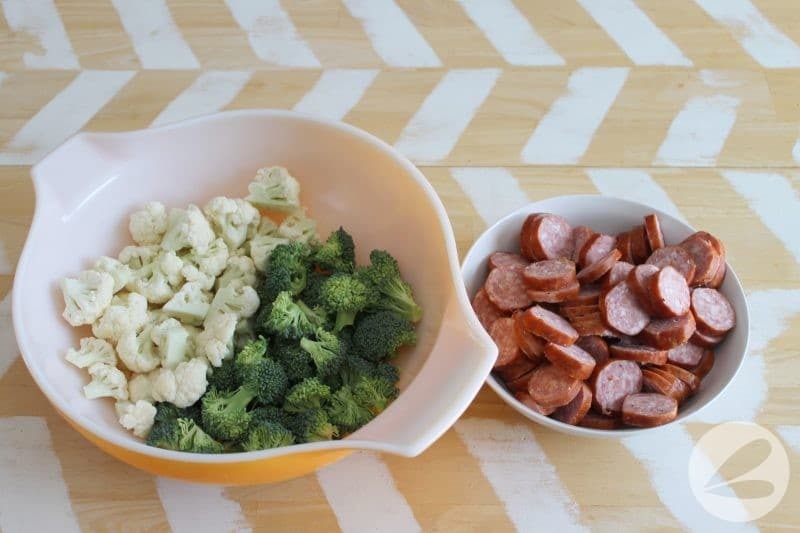 Slice the sausage and cut up the vegetables. Combine all ingredients except cheese into a large freezer safe plastic bag. 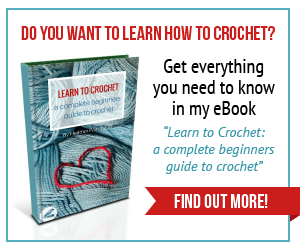 Freeze until ready to use (up to three months). 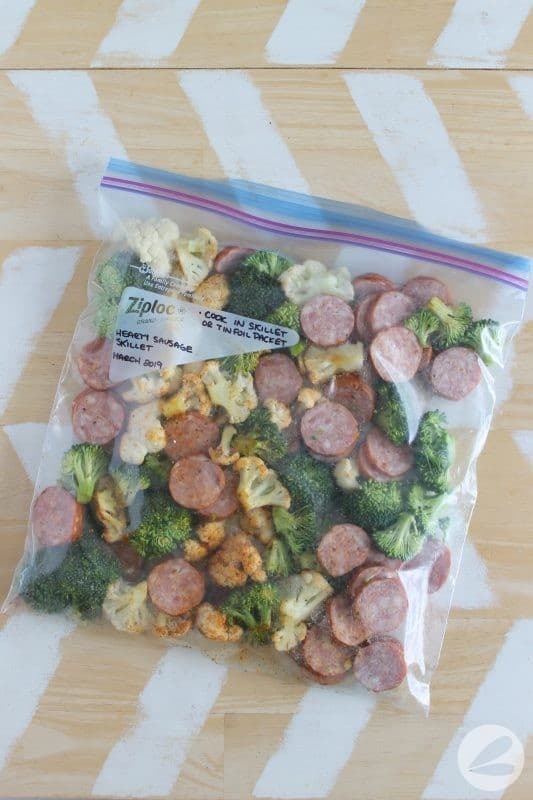 Defrost and cook on a skillet or in a tin foil packet. Cook 10 minutes on medium heat.